One of our favourite things about The Lodge is the food! Being so close to nature, our chefs are lucky to have an abundance of fresh ingredients right on the doorstep. 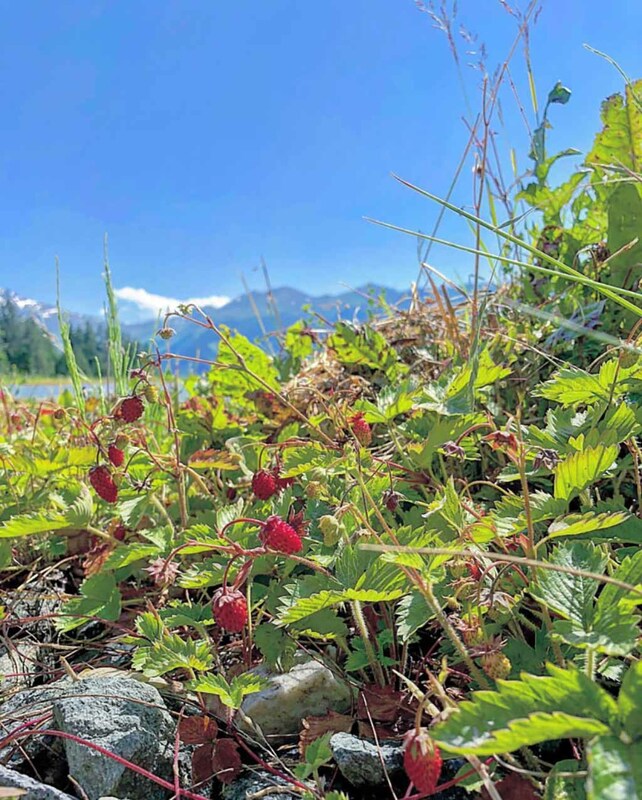 The summertime only adds to the excitement, with delicious fresh wild strawberries and cherries ripe for the picking. 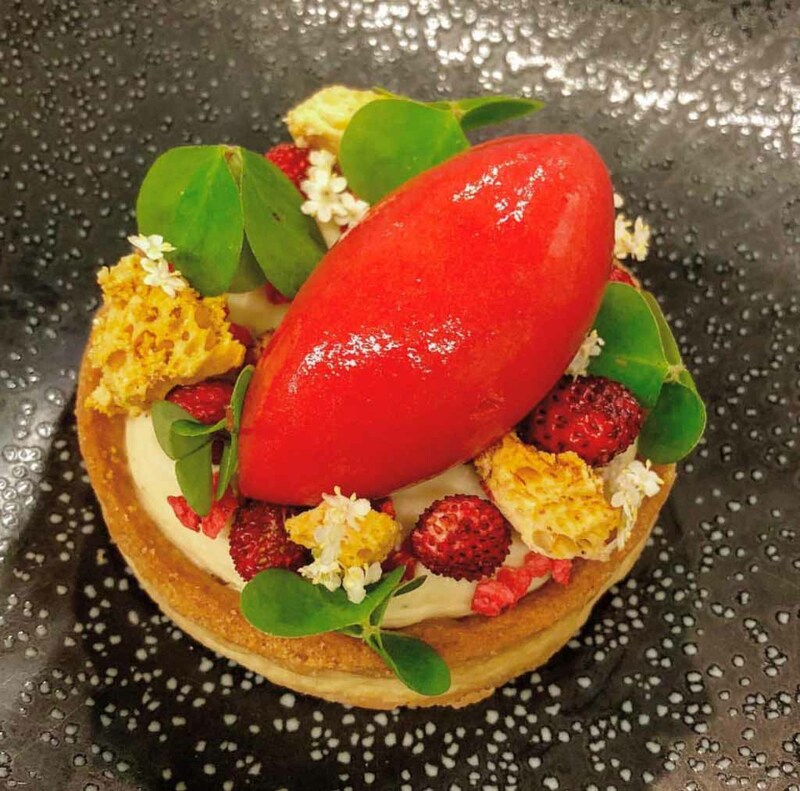 This dessert is a particular favourite of ours, it’s all from Verbier (with the exception of the tonka bean) and the strawberries and sorrel are freshly hand-picked! On the day, one of the chefs will get up an hour earlier and go for a scenic hike to pick the berries and wood sorrels before work. 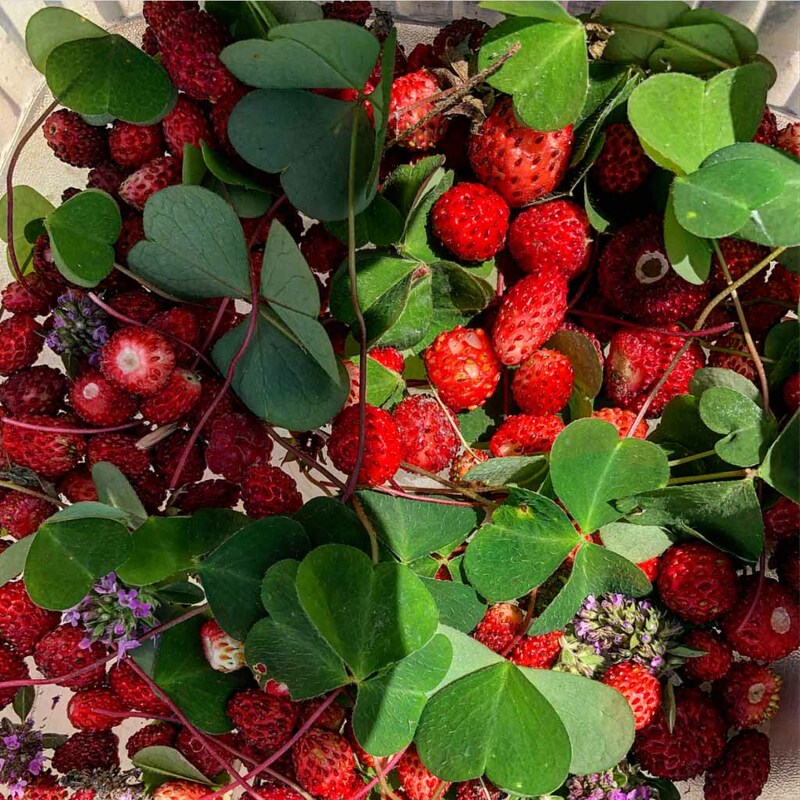 The wild strawberries have a wonderful sweet candy sherbet-like taste, while the wood sorrel (oxalis) has a strong citrusy flavour. Combine the dry ingredients in a food processor, and pulse in the butter to form a breadcrumb texture. Add the egg and egg yolk in the machine, then turn out onto the table and bring the mixture together to form a dough. Be careful not to overwork it. Roll the pastry between two sheets of baking parchment and rest for an hour in the fridge. Cut your pastry to a little bit larger than your desired tart cases, then gently press the pastry into the mould. Prick with a fork to stop them rising and bake for around 10mins at 160°c or until golden. Heat the milk and tonka bean, then leave to infuse for an hour. Dissolve the yolk, cornflour and sugar together and add the milk, cook gently, continuously stirring, to form a thick custard. When cooked, place clingfilm on top of the custard, to avoid a skin, and refrigerate. When cool, use an electric whisk and whip on a high speed. Squeeze out the gelatine and melt it (the easiest way to do this is putting it in a cup and microwaving for 20 seconds). Add the melted gelatine to the whipping custard. In a separate bowl, whip the gruyere cream to soft peaks. Fold this with a spatula into the custard. Your creme diplomat is done! Simply blend the sugar and strawberries together until the sugar has dissolved. Pass this mix through a sieve to remove the seeds, and churn in an ice cream machine. PSST! Don’t fancy making your own? Simply buy a good quality sorbet from your local supermarket. Put all ingredients, except the bicarbonate of soda, in a pan and make a caramel, using a sugar thermometer bring the caramel to 158°c. As fast as you can whisk in the bicarbonate of soda, it is important to do this well enough that the powder is dispersed and there are no lumps, but not to go so much you knock out all of your bubbles. Straight away decant the honeycomb from the pan onto a papered tray and leave to cool. You should see it still growing at the beginning. Refrain from touching (or eating) for at least an hour! Fill the pastry tart cases with your creme diplomat. Scatter pieces of Verbier honeycomb and a generous number of your wild strawberries. Garnish with a scoop of sorbet and some of the wood sorrel.